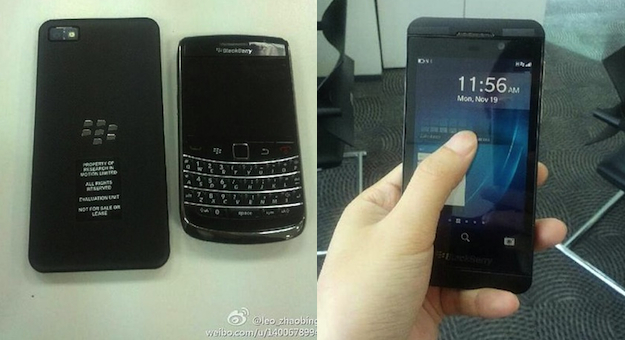 The L Series BlackBerry 10 phone has been leaked again, this time appearing in CrackBerry.com’s forums, where a handful of pictures showed the phone up close, as well as being compared to a BlackBerry Bold 9700. Research in Motion’s L Series handset is one of two phones on which it will launch the BlackBerry 10 operating system next year, where it will be joined by the more traditional QWERTY keyboard-equipped N Series. In the snaps, the L Series — marked as an evaluation unit — looks the same as it did back in September, when both it and the N Series phone last appeared. The long, black chassis remains, while the front has the slight look of Sony’s Xperia range to it, thanks to the edgeless screen. Sitting next to the Bold, it also looks quite long. The source of the leak hasn’t provided any more information on the specification, but if previous rumors are correct, that’s a 4.2-inch screen with a 1280 x 768 pixel resolution, and a dual-core processor should be hiding inside. RIM has already announced when the L Series will be made official, as it will be holding an ambitious, global launch event for BlackBerry 10 on January 30 next year, where both phones and the new software will finally make their public debut. There were concerns RIM would miss the first quarter release date, which it has continually stood by, but according to the company’s COO Kristian Tear, BB10 handsets will on sale within 30 days of that event. This means it’ll make its self-imposed deadline, but only by a whisker. Despite the fact the OS is still a bit of a mystery, and there are several months to go until we get to try it out, the company’s stock has been performing well; perhaps assisted by BlackBerry 10 gaining government security clearance and RIM drip-feeding us details on new, interesting features such as BBM Voice. Will the L Series be enough to tempt iOS, Android and even Windows Phone fans away and into RIM’s waiting arms? We’ll find out next year.